Needless to say our internal clocks are out of whack and I don't think either one of us slept too much. We had to set the alarm for 5 AM in order to leave for the airport at 6:45. Today we fly to Lijiang. I took a couple of pictures from the apartment balcony of the new, still under construction, but topped out, 108 story office and hotel building. WOW! We enjoyed a nice breakfast then packed an left in a minivan taxi for the airport. Shanghai is an amazing city. We are anxious to get back and see the sites in a couple of weeks. The other airport is smaller and did not take long to get there. After we got on the plane there was a slight air traffic control delay. The flight attendant announced that "the flight would be delayed for 'sometime'." It was explained that this was 'Chinglish' and could mean anywhere from a short delay to a long delay. We were lucky...10 minutes. We arrived in Kunming in three hours where we deplaned for about 30 minutes before continuing on to Lijiang (Yunnan Province). We arrived in Lijiang 40 minutes later. The altitude is about 7000 feet, cooler and much less humid. Our driver and tour guide met us (a recommendation by our travel agent to ensure we received good treatment in the smaller non-metropolitan areas). The cost was very reasonable and they got us into everything very quickly. We have a very comfortable Buick minivan. 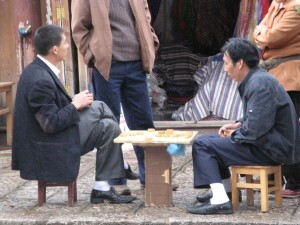 It took about 40 minutes to drive from the airport to Lijiang. We didn't get too many glimpses of the mountains yet due to low cloud cover. Our hotel is very nice. 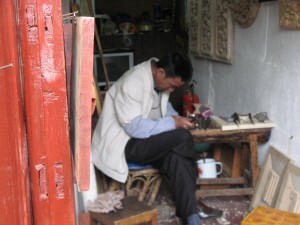 We spent about 30 minutes freshening up and then went back into town to tour the Old Town (See below) of Lijiang. We took a lot of pictures, ate a variety of foods from street vendors, (boiled corn on the cob, fried sweet pizza like desert) and drank a lot of water. We saw the old water wheels, went up and down the small cobble stone streets. We went into several courtyards to view the wood work and courtyard floors with intricate mosaics emphasizing long life and prosperity. We visited the Regional Emperor's palace. It has a layout similar to the Forbidden City but on a smaller scale. It was time to go eat. Since it was wild mushroom season, we went to a restaurant that specializes in mushroom soup prepared in the center of our table. 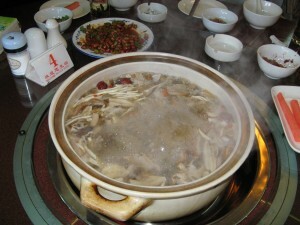 Using a chicken broth, the several varieties of mushrooms are boiled in the broth for about 15 minutes, then a choice of meat is put in. Then over the course of the next hour various other ingredients are placed in the pot such as, a potato like, a root from another plant, spinach, what looked like lettuce and many other things. It was very good. We ended the evening attending a Minorities show (See below) that presented about seven different Minorities life styles through song and dance. We had front row center seats. It was very enjoyable, but we had a hard time keeping our eyes open due to the loss of time during our flight and the short time after our arrival last night. You can view a short clip of the show by playing the below video. It is true what I read in other blogs. 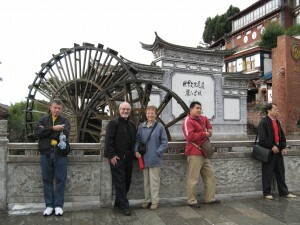 For some reason the Chinese people/tourists just have to get their picture taken with us Westerners. It happened several times today. Some people are very blatant and will just stand next to you while you are watching. Others try to be sneaky about it and do it slightly off to the side or in front of you. I am tired and need to go to bed so I will upload just a few pictures today. ///NOTE: Items in italics are excerpts from guidebooks or web pages which describe sites we visitied better than I can /// Old Town: When visitors and travel guide writers gush about Li Jiang, they're really referring to its raison d'être, the old town (gucheng), built over 800 years ago during the Southern Song dynasty. A delightful maze of twisting cobblestone streets and Naxi-style homes but more and more shops, usually of the souvenir variety, the old town still affords glimpses of traditional Naxi life as residents go about their daily lives despite the staggering crowds and the increasingly commercial tenor of the whole place. Unlike many ancient towns in China, Li Jiang does not have a city wall. It is said that the first ruling family of Li Jiang, surnamed Mu, prohibited the building of a wall around the old town because drawing a box around the character of mu turned it into the character kun, meaning "difficulty," and was therefore not auspicious. What the old town does have, however, is a web of flowing canals fed by the Yuquan springs in today's Black Dragon Pool to the north. These streams often flow into several three-pit wells scattered around the old town with designated pits for drinking, washing vegetables, and washing clothes. You can see such a well at the Baima Long Tan in the south of town Old Town Bar Street The Yican Quan, for drinking water only, can be found on Mishi Xiang next to the Blue Page Vegetarian Restaurant. The old town used to have several water mills as well, but the only one standing today is a reconstructed water wheel at the old town entrance. In the center of town is Market Square (Sifang Jie), ringed with shops and restaurants. During the day, Naxi women come here to trade, and on certain evenings, residents will gather here and break into spontaneous circle dances. 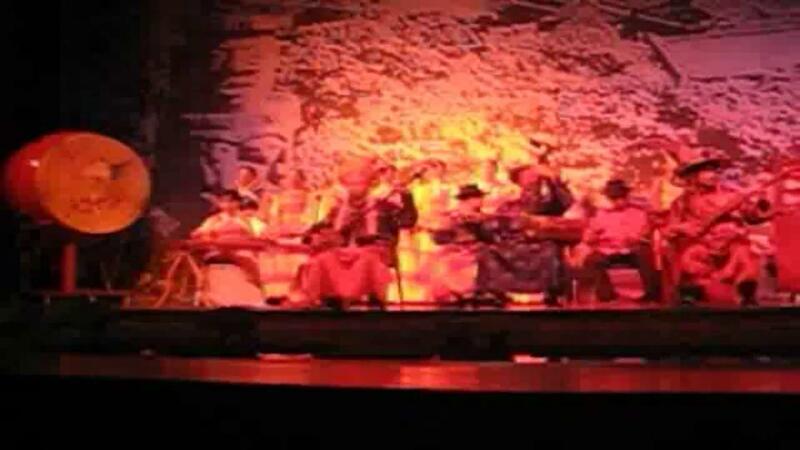 Watch Lishuijisha performance: Attending a Naxi concert is one of the more popular evening activities in Li Jiang. The original Naxi Orchestra at the Naxi Guyue Hui (Naxi Music Academy) is led by esteemed Naxi ethnomusicologist Xuan Ke, who delivers introductions and explanations to the music and instruments in both English and Chinese. Nightly performances are held at the Naxi Concert Hall (Dong Dajie) from 8 to 9:30pm.